Courtesy of C3 Real Estate Solutions, LLC, Brian Trainor. 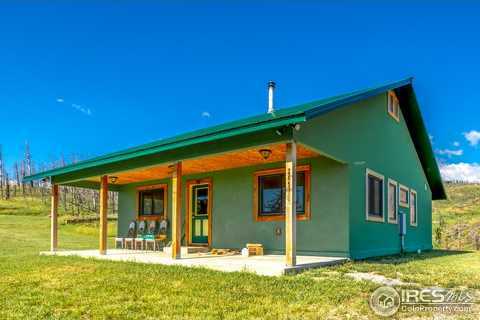 This amazing home sits atop the hill with amazing views and lush green pasture. So private and peaceful. The home was designed to be maintenance free with a metal roof, stucco siding, concrete kitchen counters, beetle-kill cabinets, trim and flooring. Efficient radiant wall heat plus a beautiful wood stove. Metal shop is wired for additional lighting. Property is on cistern but wired for well. Year round spring feeds a tiny pond. Absolutely no drive-bys. Must be accompanied by a realtor. Please, send me more information on this property: MLS# 858476 – $425,000 – 265 Helms Deep Rd, Bellvue, CO 80512. I would like to schedule a showing appointment for this property: MLS# 858476 – $425,000 – 265 Helms Deep Rd, Bellvue, CO 80512.